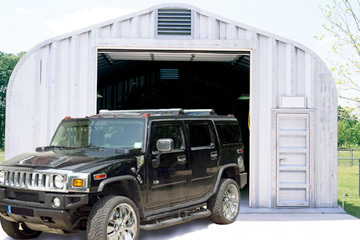 If you’re looking for a sturdy, safe way to store your vehicle, U.S. Buildings’ steel building garage kits and prefabricated garage kits are the perfect solution. Our buildings and prefabricated kits will help keep your vehicles safe from both, damaging elements and theft, at an affordable cost. Whatever your automobile storage needs, from a small residential addition to a large scale storage unit for your dealership, U.S. Buildings carries pre-engineered steel garage building kits that can be fully customized to suit your needs. Our building kits come with column-free interiors and can span up to 200 feet, allowing for easy parking and maneuvering without the hassle of navigating around support beams. You can save on time and money by ordering one of our building kits which can be built in a fraction of the time it would take to build a traditional building. We ship directly from our factory to customers and all of our products are guaranteed with a 35 year limited warranty direct from the steel mill. Our structures have been rigorously tested by independent labs so our customers get only the highest quality and durability in their steel building. As an American company, we value excellence, leadership and unmatched quality in our industry. When you call U.S. Buildings for the first time, you will speak directly with one of our highly trained building consultants, who will review your specifications and needs and give you a custom recommendation for your project. From the first call to long after a building is in place, our customer’s complete and lasting satisfaction in both our product and service, is our top priority. Call U.S. Buildings now toll-free at 800-222-6335 to speak with one of our customer service specialists. Be sure to ask about our monthly money saving building specials that could save you up to 60% off your steel structure. Let us know about the specifics of your building projects and we’ll provide you with great options, a competitive price and a building that you’ll be proud to show off. Call us now!